Villa Anassa is situated on a small gated development called Amorosa which is located at the waters edge. Access to the Yiannakis Beach is gained through a specially designated walkway surrounded by landscaped gardens. Yiannakis Beach is one of the best beaches in Cyprus. The Villa has amazing views of the Baths of Aphrodite which is situated near Turtle Beach, Blue Lagoon and the Akamas National Park. With its crystal clear waters this is a fabulous place for water sports and snorkelling. This beach is regarded as one of the best in the region and is within 50 metres walk of Villa Anassa. This private location also offers a tennis court for the benefit of the residents and guests. Villa Anassa is fully air conditioned and furnished to a high standard. The property has 2 bedrooms, 2 bathrooms, an outside lounge and dining terraces overlooking a Private Pool and a fabulous large stone barbecue. With private landscaped gardens and private parking and Car Port. The master bedroom is on the First floor and has a King size Bed and Shower en suite. The patio doors in this room lead to a balcony which has fabulous panoramic views of the Sea and Baths of Aphrodite. A perfect place to sit reading and watch the sun go down. The 2nd Bedroom is in close vicinity to the master bedroom and has twin beds ( which can be made double ) and a bathroom with bath and shower. A white marble staircase descends to a spacious Open Plan Living Area with comfortable furnishings and Dining & Kitchen Area. Patio doors lead from here to Outdoor Terraces. The TV has IPTV multi channels offering news, music, movies dramas and multi language channels. Apple TV is available using your own password to access your movies and music. A fully equipped modern kitchen which includes a dishwasher, washing machine, hob, oven and fridge freezer. The kitchen door leads directly to the Barbecue area. The pool area has sun loungers, umbrella for shade and outdoor shower. Villa Anassa is set in landscaped gardens. A private gate on the estate gives access to Aphrodite Beach Hotel and Beach Bar, this is a 5 minute walk. Water sports are available on the beach with Lifeguard in attendance during the summer months. A 10 min stroll along the beach will take you to the fabulous 5 star Deluxe Anassa Hotel The Sunset Bar is a perfect place to sip a cocktail whilst watching the sun go down over the Baths of Aphrodite or enjoy the same fabulous views from the terace of Villa Anassa. Villa Anassa surpasses all others in terms of location, quality and prestige. *Villa Anassa has a sister property Villa Aphrodite ( Home Away ref 8832293 ) positioned next door also with its own private pool. Perfect for families and friends who wish to share their holiday but require separate private accommodation. * A car is not necessary as the villas are so close to the beach, local taxis are available and a bus stop is situated right outside the main gate of the estate. My name is Janet and I live in Edinburgh, Scotland. My husband part owns the Villas with his Business partner and I have the fabulous job of ensuring the properties Villa Anassa ref 8124348 and Villa Aphrodite ref 8832293 are available as holiday rentals. I have personally made each property individual with different interiors and furnishings making them modern but homely and comfortable. Villa Anassa and Villa Aphrodite Ref 8832293 are situated in the fabulous Amorosa development by the Mediterranean. Our families have been coming to the Island of Cyprus for 15 years, our children have grown up holidaying in the properties and have many fantastic memories of the Beach, eating out in local restaurants, the Akamas Park and snorkelling in the Blue Lagoon. A perfect location for a family holiday. The attraction to this area is the positioning of the property to one of the best beaches in Cyprus. From the Villa it is 50 metres walk to Aphrodite Beach and the local Beach bar serving great Seafood and local beer. Easy access allows us to move between the swimming pool and the beach. Sun beds and umbrellas are available April to October with the presence of a lifeguard which puts our mind at ease when the children are swimming. Water sports are also available. The sea is crystal clear for swimming and snorkelling. We can take a boat out from Latchi Marina and drive a short distance along the coast to the blue lagoon where we anchor, picnic and snorkel with a fabulous view of the Akamas peninsula. The bay is beautiful with the Anassa Hotel perched on its own, neighbouring our properties. We have many favourite restaurants in the area from fine dining in the hotels to local Beach cafes and marina restaurants which are dotted along the coast line of Latchi . Yialos being one of the cheapest and our favourite on the beach. We can walk along the beach to the Anassa Hotel anytime of day and have a drink in the cocktail bar at Sunset or choose to stay at the Villa on the terrace and look at the amazing views while the Sun goes down. For a small fee there is access to the gym facilities and treatments available at the Spa.The local friendly taxi company Nissos and the local bus service gets us around without a car. Papantoniou is the large Supermarket in Polis which has everything food, flip flops and inflatables. Polis is the next door town where you can eat and experience Cypriot culture and dancing on a Friday evening. A 45 min drive takes you to Paphos Shopping Mall which is perfect when it gets too hot. The properties are beautifully designed and in an amazing location. With their individual pools and gardens it is very private. I love the fact that it is very safe for families with young children, but equally teenagers who want to go off to the beach on their own, they can have that independence. We also have the facility of a shared tennis court and our estate is gated purely to stop cars coming in and out or parking to use the beach. The gate is manned 24 hours and the person on the gate is happy to help with taxis, bus timetables or any other help you may require. On the first floor I love to sit on the balcony and take in the breathtaking views of the Baths of Aphrodite. We have hired the services of a fantastic property management team Pete and Irena who stay locally and are on hand to help our guests have an enjoyable stay. Fabulous Views of the Ocean from the Bedroom Terrace with seating area. Hand, Bath and Pool Towels provided. 30 mins drive to Golf Courses. Pete and Irena manage Villa Anassa and Sister property Villa Aphrodite Home Away ref 8832293. On booking the property you will receive an email with attached Booking Form requesting flight arrival & departure details, contact info including names and ages of guests staying in the Villa. Pete will email introducing himself and giving key code and directions. He will also help with Car hire, Taxis and groceries. Pete and Irena are extremely helpful and a friendly couple who will be available if you require anything during your stay. They live close by and have a wealth of experience of the area and will be happy to recommend local restaurants and places to visit. Wonderful stay in a fantastic property! Great facilities and a lovely villa. Loved the on site tennis court and proximity to the beach. We had a wonderful 2 weeks holiday at Villa Anassa in Neo Chorio ("villa in Latchi") in late September/beginning October. The weather was still gorgeous, 30 degrees Celsius every day. As the villa is right behind the lovely quiet natural beach, there is usually a light breeze, so perfect temperature. There is a little path which leads to stairs down to the beach, which i wandered for many happy swims in the warm and clean sea. It really only takes 5 minutes to get to the beach. The beach is quite long and you could walk along it to a couple of restaurants with loungers and umbrellas. The villa itself is very comfortable: big beds and sofas and areas to sit outside and on the balcony, even the pool loungers are super comfortable! It is a really quiet and green neighbourhood with flowering shrubs everywhere. We were able to really relax and ended up spending a large part of our holidays around the house, by the good sized pool. I don't like it when the pool smells too chemical, but this pool was great, even the birds drank from it. The villa is equipped with everything you could possibly need on your holiday, with ensuite bedrooms, fully functioning kitchen, big flat screen tv with hundreds of english speaking channels, and mosquito screens on all doors and windows. We very quickly felt at home!! Pete, the manager, was very friendly and ready to advise with any questions or requests we had. He got some shopping for us for when we arrived, as we landed in Cyprus late in the evening. I have to say that this was the nicest villa i have ever stayed in and i wish we were still there now! I'm very much hoping to come back!! Thank you for your wonderful review Bea. We are delighted that you had a wonderful time, you have described the area perfectly. It is one of the most beautiful spots in Cyprus. If you do decide to return and Villa Anassa is booked please note Villa Aphrodite Home away 8832293 situated next door is also owned by us. Thanks once again for your fantastic comments. Anassa Villa is a beautiful , quiet spacious home from home with everything you could want on your holidays in a great location. Its 3 minutes walk from a lovely natural quiet beach and 5 to 15 minutes drive from restaurants, supermarkets in Latchi and Polis and from the Akamas nature reserve. The weather was dtill great in October and we had relaxing blissful holidays. The villa has mosquito screens on all windows and doors, so no problems even for people allergic to bites. The master bedroom is lovely with a balcony and views to the garden and sea, with big comfortable beds. And onsuite!! We spent a lot of time by the quite big private pool with umbrella and very comfy sun loungers. I don't like very chemical smelling pools, but this one was great, even the birds drank from it. The lounge has a big flat screen tv, comfy leather vouches and literally hundreds of english channels. With replay!! The kitchen is well equipped, very good for cooking the beautiful local fresh vegetables and fish and seafood! I have to say this was the nicest villa we ever stayed in , which made this a really blissfully relaxing holiday. We appreciated the manager Pete being available and giving great tips on where to go and what to do. Thank you to Pete and to the owner for a fabulous holiday!! Absolutely delighted that you had a great stay in Villa Anassa. A fantastic villa in a great location! This was the perfect place for a relaxing family holiday. The villa is modern and spacious, immaculately presented and well-equipped with everything you could need, including lots of lovely loungers and outdoor sofas on the various terraces. The two bedrooms and their ensuites were roomy, and we particularly liked the terrace outside the master bedroom which caught the sea breeze and some shade after lunch each day. The pool was fab, big enough to keep our two teenage sons happy all week, and the stunning beach is less than 5 minutes walk away. Latchi is a few minutes away by car, with some great restaurants and a few shops. We visited Yialos restaurant on the beachfront 3 times during our stay; great food and spectacular sunsets every night. (Book if you want a table on the front row right by the beach). We picked up a hire car at Paphos airport (this cost about the same as using taxis to and from the airport) and it was an easy drive to the villa, and to the supermarket in Polis during our stay. Latchi Watersports were a lovely bunch of people - we tried wakeboarding, and also hired a motor boat (with a tow-along donut!) for a morning to visit the Blue Lagoon and other bays along the coast and this was definitely one of the highlights of the holiday. Janet was in touch once we booked, with lots of help and advice, and Pete, the manager in Cyprus, was friendly and helpful - nothing was too much trouble. A lovely place which we will hopefully return to in the future. I am absolutely delighted you had a great time at Villa Anassa. Sometimes our photos and description on the website don’t do the property justice so thank you so much for your 5 star review of the amazing experience you had at the Villa and of the surrounding area. Look forward to welcoming you back in the not too distant future. Wonderful holiday in this fabulous villa. We have recently returned from a week in this villa (me, my husband and two daughters, 23 and 19) and have to say it was one of the most relaxing holidays we have ever had. The villa is beautifully furnished down to the smallest detail and has everything you could wish for to make it a home from home. Janet ensured that we had all the information we needed to make the most of our stay and we were met on arrival and shown around the villa by Richard who also came twice during our stay to maintain the pool. We hired a car for the first half of our holiday so that we could see some other parts of the island, (I would highly recommend a visit to the Sterna winery) although there appears to be an efficient bus service which runs right past the development. The second half of the holiday was spent relaxing by the delightful pool and visiting the beach which is a leisurely five minute stroll away. There was a delightful beach bar serving excellent food where we ate lunch and then we would take a taxi into Latchi in the evening to eat at some of the lovely harbourside restaurants. (Approx 8 Euros) There were beautiful views from the terrace outside our room and it was the perfect place to start and end the day. The development has 24 hour concierge service and is immaculately maintained. I really can't fault this villa and as Janet also owns the villa next door we are hopefully going to return with friends and hire both villas. Thank you Janet for ensuring we had a wonderful holiday. Absolutely delighted you all enjoyed your stay in Villa Anassa. I am pleased that you loved the property and its surroundings. Great to hear you explored the island but also took time out to chill by the pool and at the beach, its a real bonus that the villas are so close to the sea. The facility of a reliable taxi company ( Nissos Taxis ) ensures you can go the short distance to Latchi to experience the restaurants and sunset views. Villa Aphrodite next door is also perfect for 2 families who wish to holiday together but require their own space. The property has the same layout as Villa Anassa the only difference being a kidney shaped pool. I look forward to welcoming you back to our villas and the beautiful island of Cyprus. We had a wonderful 2 weeks at Villa Anassa. As for the review - where do we start!?! The house is fantastic - a real home from home. Everything you could want is there from extensive TV channels, comfy beds, well equipped kitchen to the high standard of decor and upkeep. The pool was superb and the outside eating and seating area was wonderful - many hours spent on the outside sofa. The villa is situated half way between Latchi and Aphrodite Baths and whilst a car is useful, we used Nissoss taxis (about 8 euro into Latchi) - they were great and we even hired a car from them for a few days. Latchi has a decent supermarket but the key attraction is the many fab restaurants. The beach is within a 5 min (slow) walk. Mostly pebbles, it was beautiful and quiet - there is a beach bar/restaurant within 5 min walk. Cannot recommend the property enough and the owners went out of their way to ensure we had a fab holiday. Thank you to the Roberts Family for booking Villa Anassa. We are delighted that you all enjoyed your holiday and your stay in the property. Its good to know that you don't always have to hire a car due to such good taxi service. Also there is a great bus service too and the stop is a short walk from the villa. Next door to Villa Anassa is its sister property with the same layout and standards only with kidney shaped both pool. The two properties are ideal for extended family or friends to be able to stay in close proximity without being on top of each other. Thanks again to our guests the Roberts family. Villa Anassa is situated on the AMOROSA development on the North West Coast of Cyprus in Latchi between Polis and the Baths of Aphrodite a region steeped in mythology and rich in history. It is located 500m from the most beautiful and serene place in Cyprus, the Akamas Peninsula National Park. A magnificent backdrop of hills and conservation land invites a sense of beauty and tranquility. The Akamas National Park is a protected area of outstanding beauty and attracts many horse riders,cyclists and hikers. A haven for flora and fauna protected by the Cypriot government. Some of the most important inhabitants of the park are the turtles at Lara Bay, a stunning stretch of beach accessible only by boat or 4x4. Hidden in the mountains of the peninsula are several wineries. Zambartas and Vouni Panayia wineries are recommended. Villa Anassa is perfectly placed at the beach between the Aphrodite Beach Hotel and the 5 star Anassa Hotel & Spa overlooking Chrysochous Bay and the Baths of Aphrodite. Sun Beds and umbrellas are available on the beach.The clear turquoise and calm waters of the sea in the area, make it perfect for swimming or kayaking. Villa Anassa is close to the picturesque harbour of Latchi. From here you can take a boat to the Blue Lagoon and spend the day snorkelling in the clear turquoise water. Latchi is known for quality fresh fish and excellent seafood. The old stone Carob warehouses and conversions into Tavernas and Marina offer a great selection of food. Relax, bathe in the sunshine and eat freshly cooked fish and local vegetables, washed down with a local ice cold beer or glass of wine. The beaches and clear, pristine water of Latchi offer a variety of water sports. Ideal for scuba diving, snorkelling, water-skiing, windsurfing, jet- skiing, para sailing, sailing and fishing. Boat trips along the coast leave regularly from the harbour and small boats can be rented for the day to explore the Akamas coastline. Cruise to the Akamas, bathe in the Blue Lagoon and admire the sea caves. Latchi has a selection of Beach Bars/Cafes and restaurants, mini markets, gift-shops, car rental, taxis plus ATM. offering excellent food and wine, with traditional Cypriot entertainment and dancing often featured during high season. Also facilities include pharmacies, Medical Centre, Petrol station, Bus station and a large Supermarket. The championship golf courses of Secret Valley and Aphrodite Hills are in Paphos area and approximate 55 mins drive. During the hotter months of the year head into the hills to play in a slightly cooler climate at Minthis Hills Golf Course approximately 30 mins drive from Latchi. Rent a car at the Airport or in Latchi, and explore Cypriot villages, historic and archeological monuments, monasteries or markets. A car is not necessary as the villa is so close to the beach and a Nissos the local Taxi company do transfers to and from the airport as well as local trips to the Supermarket and restaurants. A bus stops at the end of the street and regular services into centre of Latchi. 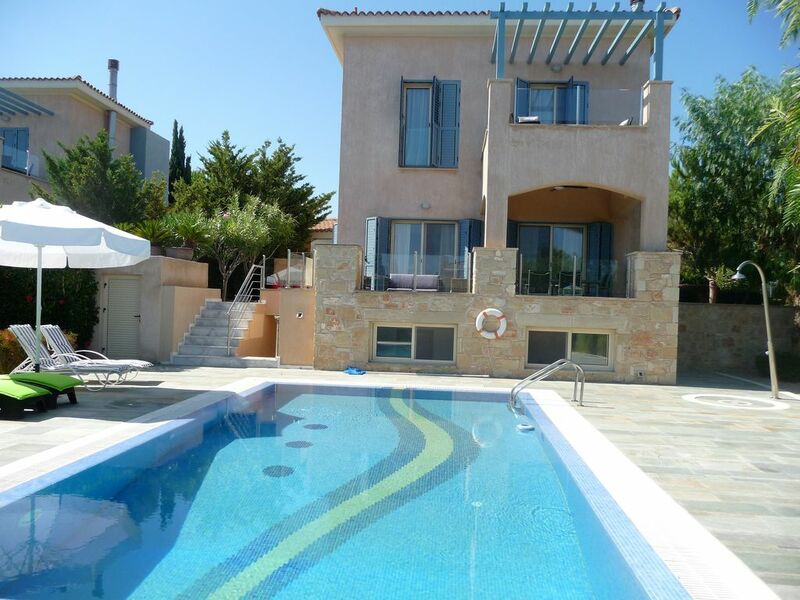 The villa is situated 45 min drive from Paphos and 30 mins from Coral Bay. Approx 90 mins to Limassol and the Troodos Mountains. Arrival 11am and Departure 4pm we appreciate flight times are variable so we will do our best to be as flexible as possible if required. Please confirm with the Property manager Pete Jenkins. Damage Deposit required on arrival. Electricity charge is additional to the rental fee and paid to Pete Jenkins on departure. A meter reading is taken on your arrival and will be deducted from the damage deposit and the remaining amount returned if no damages. Rates are subject to change until reservation is confirmed. Damage Deposit A damage deposit of £200 will be required, this will be requested from our property manager Pete Jenkins who will give bank details after booking is complete. Electricity Charge There will be a separate charge for electricity, the meter will be read on arrival. On departure another reading will be taken and the amount deducted from the damage deposit and the remainder refunded in 7 days assuming there are no damages.